Quilting at Alma Sue’ Quilt Shop, Pinecraft, Florida. Photo by Anna Leigh Avery Vaughn. Ella Miller Toy asked me today, “Now don’t you wish you would have come down here to do research?” The simple answer, yes. She forgives me, I hope, because she understands that I was naive about all Pinecraft, the Amish community on the outskirts of Sarasota, Florida, had to offer. I didn’t realize the full extent of Amish community life that exists here. As Ella explained, I could have just come here and learned all about Amish quiltmakers from all over the country, because they all winter in Pinecraft. Ella owns and operates Alma Sue’s Quilt Shop, which felt like the closest thing to the old fashioned “quiltings” I write about. The shop, bustling on a Saturday morning in peak tourist season, features two full quilting frames, where Amish and Mennonite women–both year-rounders and snow-birders from across Pennsylvania and the Midwest–gather together to stitch quilts for Alma Sue’s customers. In the big frame was a huge quilt, a Roman Stripe with a black ground and vibrant multi-colored stripes. Ella had her ladies working on this for her new brochure. She explained that only her best quilters are allowed to stitch on this one. Perhaps because no one had the heart to tell me “no,” I sat down at this frame, found a thimble, and began quilting. Katie and Anna, the two elderly Amish women sitting with me, paused to look at my stitches. They assured me they would not take them out, and seemed surprised, noting this must not be the first time I quilted. I confirmed that it wasn’t, recalling how I learned from my own grandmother some 20 years ago. In addition to the handquilting, several full-size long-arm quilting machines sit toward the back of the shop. 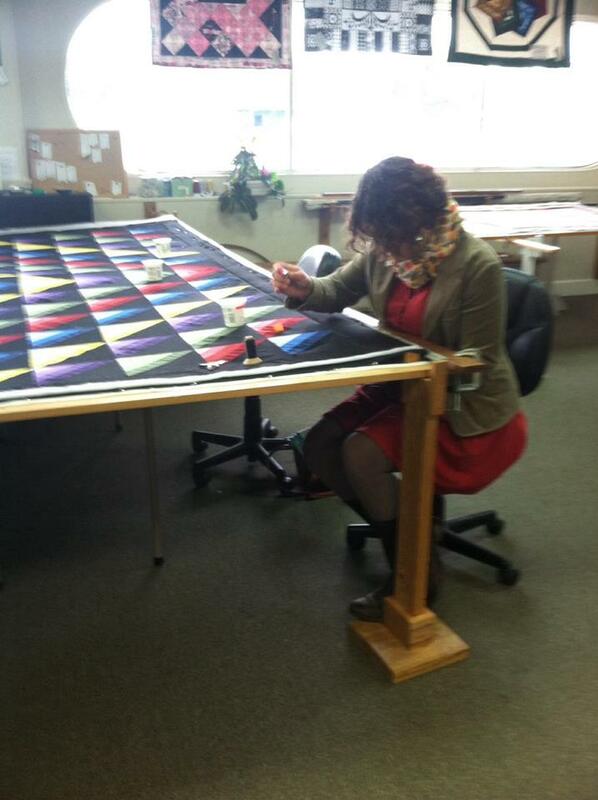 Here Alma Sue’s staff completes customers’ quilts much faster than even the most efficient hand quilters can. These weren’t in use this morning. But other staff gathered around work tables, with Ella sitting at her Singer Featherweight, demonstrating techniques for repairing old quilts and supervising the application of rick-rack on a cute yellow apron. The half dozen projects the various team members were working on reminded me of my childhood days accompanying my mother to the Mennonite women’s sewing day at our home church. Everyone had a job to do, and each seemed eager to do it well while smiling. In most Amish quilt shops in northern settlements, the proprietor farms out the tasks–the cutting, piecing, marking, quilting, and binding–to specialists throughout her region. These specialists do the work in their own homes, like in the pre-industrial putting out system. Ella does some of this at Alma Sue’s–she has skilled sewers who piece many of the tops in their own homes–but here the quilters come to the shop and perform the socially productive act of sitting around a frame to complete a quilt. In addition, Alma Sue’s sells many contemporary fabrics, notions, and books, competing with the four or so other quilt fabric shops in Sarasota. Here she also differs from the Amish and Mennonite shops in northern settlements, where quilt shops make quilts and dry goods stores sell fabric. The selection was beautiful, and if I hadn’t promised myself to use up my excessive stash before buying more, I would have done some shopping. But that would have taken me away from the quilt frame, where I so enjoyed sliding my needle through the layers, stitch after stitch after stitch, and chatting with Katie and Anna.